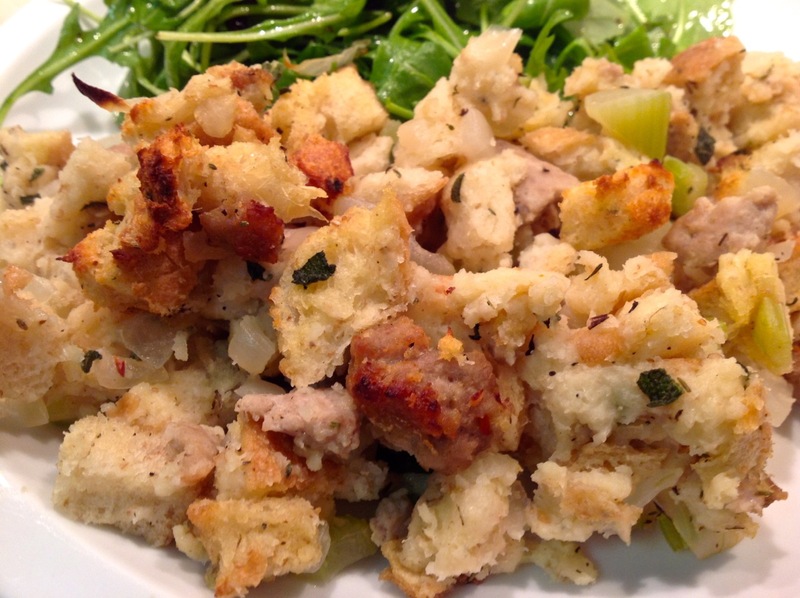 Stuffings, technically "dressings" but I like to call them stuffings so it doesn't sound like we're talking salads, are a great way to experiment with flavor at Thanksgiving. 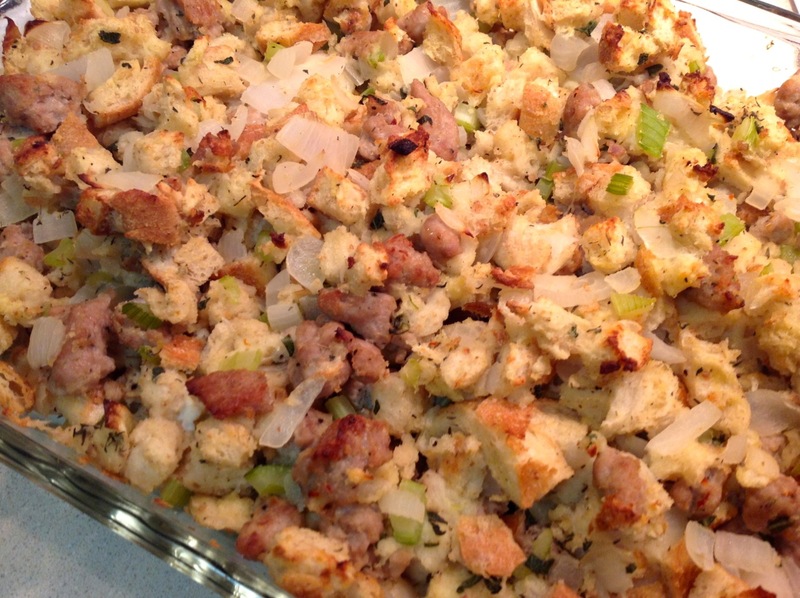 I've already shared recipes for Rye Bread Stuffing and Southwestern Cornbread Stuffing, and last year I had Italian Stuffing and Oregon Stuffing--all variations on the same theme. But sometimes you just want something basic and classic like this dish. I pared down the ingredients to the minimum for a satisfying traditional Thanksgiving sausage and bread stuffing. With fewer ingredients, it becomes more important to choose good ones to maximize flavor, such as the sourdough bread and breakfast sausage with sage I used here. Using this recipe, you could customize the dish with additional ingredients: toss in some nuts, dried fruit or other vegetables. Switch up the bread. Omit the sausage or use a different meat like bacon or prosciutto. 1. Preheat oven to 300 F. Divide bread cubes between two baking sheets. Bake in oven for about 30 minutes. Remove from oven and set aside to cool and dry. 3. Brown sausage in a large frying pan over medium heat. Remove from pan and set aside on paper towels. Wipe out pan and place over medium heat. Melt butter and sauté onion and celery until soft. Stir in sage and thyme and season with salt and pepper. Cook another minute. Remove from pan. 4. In a large bowl, combine dried bread cubes, cooked sausage and cooked vegetables. Add chicken broth and eggs. Stir to combine. Pour mixture into a 9 x 13 baking dish. Bake for 40 minutes, stirring after 20 minutes, until cooked through and lightly browned on top. I could eat a Thanksgiving meal comprised entirely of stuffings and feel quite satisfied. I like your idea of adding dried fruit to this dish. I wonder what dried blueberries would be like in a stuffing?